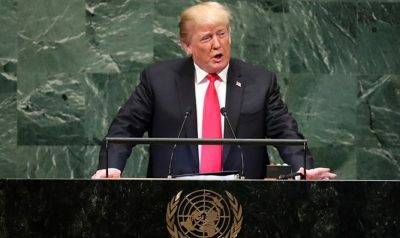 The only redeeming feature of Trump’s Tuesday UN address was not slamming Russia – other than urging Germany not to buy its oil and natural gas, calling on its government to “immediately change course,” a notion it rejects. Rouhani stressed his country’s commitment to world peace and cooperative relations with all other nations, notions the US, NATO, Israel and their imperial partners reject. “No state and nation can be brought to the negotiating table by force, and if so, what follows is the accumulation in the ‘grapes of wrath’ of those nations, to be reaped later by the oppressors,” he stressed. In 12 consecutive reports since implementation of the JCPOA, the IAEA affirmed full Iranian compliance. Straightaway while Obama was still in office, he breached Washington’s Iran nuclear deal international treaty obligations. Trump abrogated them entirely. Adopted UN Security Council resolutions are binding international law on all member states. Unanimously adopted SC 2231 (July 2015) affirmed the JCPOA Iran nuclear deal. No nation may legally abrogate it. Trump’s unilateral pullout made the US more of a pariah state than already – defying the world community, demanding all nations go along with its hegemonic agenda or else. Longstanding US policy calls for regime change in Iran by whatever means it takes to achieve its objective. As long as this aim remains unchanged, no amount of diplomacy will soften it. What Iran justifiably calls the “Great Satan” could embroil the entire Middle East and other regions in catastrophic conflict, risking humanity’s survival if things are pushed too far. Irreconcilable differences separate the agendas of both nations on trade and other key issues. Resolving them may be unattainable as long as hardliners control Washington’s geopolitical agenda. The breach between both nations is widening, a dangerous situation politically, economically and potentially militarily. US recklessness created greater China-Russia unity, together a powerful counterforce against Washington’s hegemonic agenda. China’s Global Times (GT) slammed the Trump regime, saying it “sacrifices other countries’ interests” to serve its own. It unilaterally imposes illegal sanctions on other countries, Trump more frequently than his predecessors. DLT “withdr(ew) from multiple international organizations and agreements, which has resulted in increasing the cost for other countries to maintain the international order and common interests,” said GT. His regime is “taking advantage of the rest of the world” while claiming otherwise. Russia was restrained in commenting on Trump’s Tuesday address because he refrained from unacceptably bashing the country. Iran and China responded sharply, justifiably criticizing Washington’s dangerous hegemonic agenda. It risks possible catastrophic global war, a doomsday scenario if launched and waged with nuclear weapons.